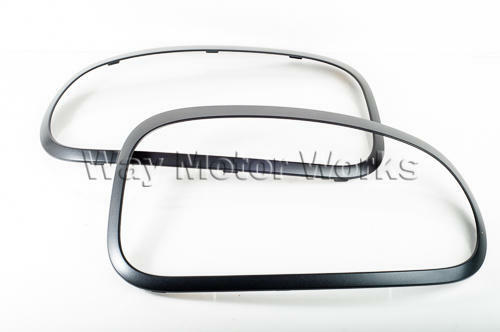 Black Out Tail light Trim Rings for R60 MINI Cooper Countryman and Countryman S, All 4. For many years MINI owners have tried to paint the tail light trim rings black, vinyl them, or plastidip them. None of these have been a great solution until now. After many years MINI finally gave use these blackout tail light trim rings molded out of black plastic so that even when hit with rocks they don't show like a painted part would. These trim rings simply snap on in place of the original chrome tail light trim rings. sold as a tail light trim ring pair, one black left and one black right ring. Genuine BMW part. Fit perfectly, The chore of putting these on though is a big one. This isn't like the front rings. You should definitely Google for directions on this. The North American Motoring forum has a few threads with info on this that greatly helped. But for the look itself, well worth it!!! Matches the front perfectly.